MANILA, Philippines - Many people didn’t really like what president-elect Rodrigo “Rody” Duterte did to GMA 7 reporter Mariz Umali. The incoming president got bashed by various women’s right groups online including, Umali’s husband and fellow news anchor Raffy Time. But on June 2, a netizen got way below the belt and threatened to kill Duterte. The veteran reporter got “catcalled” by Mayor Duterte last week during the press conference for the president-elect’s cabinet members at the Malacanang of the South in Davao City. Raffy Tima called out Duterte and posted his thoughts on his Facebook page telling that catcalling his wife is so wrong in many levels. Duterte has already explained that whistling and staring at Umali doesn’t mean anything. He also defended that whistling is not a form of disrespect or sexual harassment. Nobody can stop him from whistling, he also added. Mariz Umali shared her view on the incident via GMA News Twitter account: “We will continue to do our job and we are not expecting any apology from him personally,” pertaining to Mayor Rody Duterte. 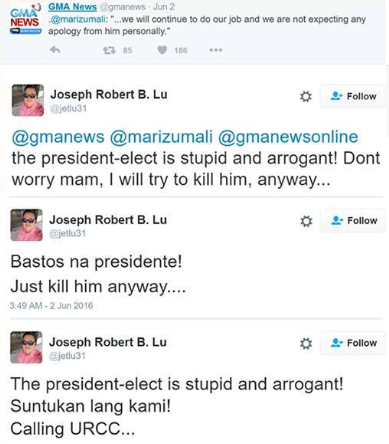 In one of the comments of the said tweet, a certain Joseph Robert B. Lu with the Twitter account name of @jetlu31, sympathized with Umali but went out of the borders by death threatening the incoming president. 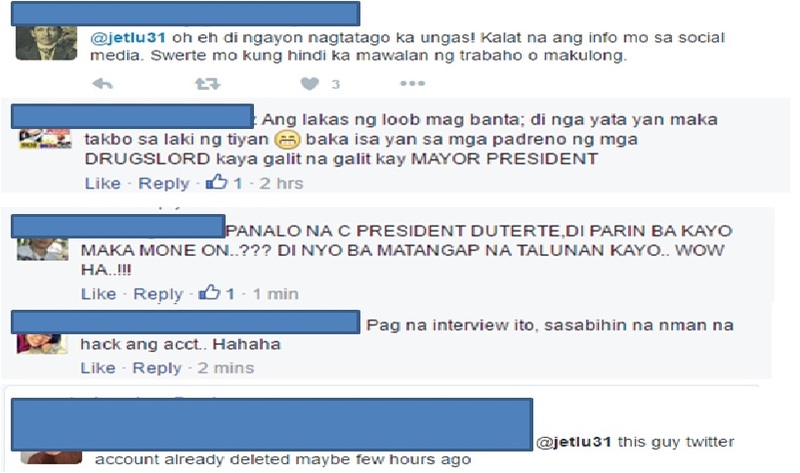 A netizen displays a violent reaction towards Duterte’s catcalling issue. Obviously, Lu is really upset and offended by Duterte’s treatment to Umali but his reactions put him into tub of hot water, and now, pro-Dutertes are hounding him online. 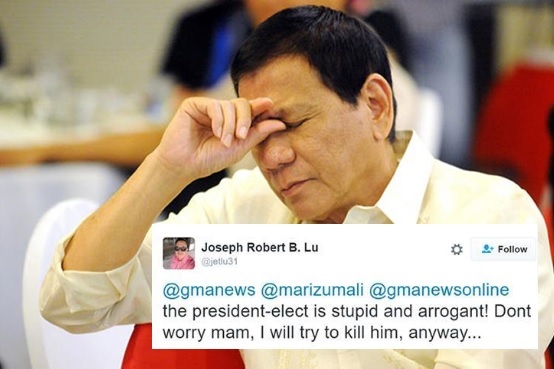 Pro-Duterte fired back at Robert Lu. As of publishing, the Twitter account name @jetlu31 has already been deactivated. It is still unclear whether the account has been hacked or cloned for trolling purposes. More likely, if this issue reaches Mayor Duterte, it’s just a waste of time to confront Lu. For sure, he’s been receiving more serious death threats from the drug lords that he’s been targeting at. Like any other politicians, Duterte eats death threats for breakfast.